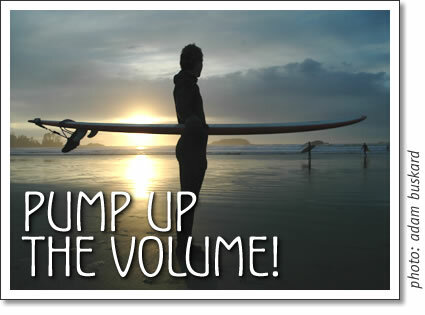 Tofino surf gear: Pump Up the Volume! My first days here as a kooky kid from Toronto back in the early 90’s where all trial and error trying to make up for 20 years of surf deprivation. I was now in surf heaven… just me and my leaky floro wetsuit, squatting in the salal. “Roughing it” if thats what you think—in paradise. The one thing I remember most in those days of surf fever where how user friendly my boards seemed. You see, they where all used boards from the late 80’s… flat, wide, and fat. They made paddling and catching our flat weak waves easy… long fast rides. This I feel is essential for surfing around here. As time moved along and more up to date shapes came into Canada, I started feeling the effect of Kelly Slaters “glass slippers”— super thin, tuned out boards that didn’t fit the rest of us. Boards where imported from around the world, fine tuned to “their” conditions. My trusty old dayglo’s lived a meaningful life but soon died from over use. My surfing in Tofino became more progressive but frustrating in our so often fickle waves. I started thinking about finding somewhere else to play. It was time to get back to basics. So now we have choices, heaps of boards at our fingertips… fishes, hybrids, eggs, longboards and still I find there is this undivided devotion to surfing low volume, over rockered boards. Believe me—on a perfect day I want one too, but lets face it, the waves here are rarely perfect and that full wetsuit head to toe ain’t helpin. I respect those few that can rip around on these boards in everyday stuff, but for most of us, it’s alot of work. How many times have you felt that you were almost about to make that wave only to be left behind in the foam? Early entry is key to getting a head start on a wave and momentum down the line. There are boards out there that do this very well and are still loose enough for the manouver minded surfer. Lately I’ve been working days with no surfs before or after, doing the weekend warrior thing, and I can feel the difference in my paddling strength, so to help with that I’ve found a board thats still a tuned up shortboard… just expanded in size. These types of boards are easy to paddle, fast, and carry themselves over flat spots which allow for more confident faster surfing( if thats what you want). They give you a feeling of being one step ahead of the wave with time to set-up for sections and turns. Surfing is all based on speed and once you have some of it you’ll be surprised what you can pull off. Rocker (bottom curve) is a crucial part of a surfboard's shape. Trust me on this one… If the waves look flat faced (our waves), so should your rocker, especially in the front entry area. If your into shortboards, this becomes more crucial. Seek these types of boards and they are usually jems. I have stupidly let go of great boards in the past for whatever reason and now realize they all shared a common thing.-Low entry rocker. A middle ground is still good. It seems our local shapers have clued into this one so they might be the fist to call when ordering a custom shape. Of course these tips may not be for everyone, but I hope it will help out someone needing a boost in the there surfing. Have fun! Take into consideration your weight, height, and real life surfing capabilities. Test boards in not so great conditions, if they go good, keep’em. Some boards have misprinted dimensions writen on them- so use your eyes and hands when comparing shapes at the shop. Never judge a board by its color or by its logo for that matter. Adam Smallwood is an avid surfer who began riding the waves of Great Lake storms before finding his way to surfing in Tofino. Tofino surf gear article by Adam Smallwood on the shape and styles of surf boards and how to pick a surf board to suit your body and style of surfing in Tofino.